There’s no doubt good nutrition and healthy diets have been compromised by the advent of GMO’s, or genetically modified organisms. GMOs – those organisms whose genetic material has been altered using genetic engineering techniques – are the source of genetically modified foods and are also widely used in scientific research and to produce goods other than food. 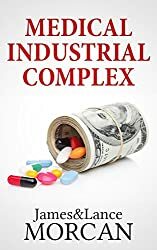 We address the contentious GMO issue in our book MEDICAL INDUSTRIAL COMPLEX: The $ickness Industry, Big Pharma and Suppressed Cures – in a chapter titled “When did your doctor last talk to you about your diet?” to be exact. Now we can’t blame the Medical Industrial Complex for the advent of genetically modified foods, but there are some parallels as you’ll see. For the sake of this little exercise, replace the term Big Pharma with the equally emotive term Big Brother and you’ll get the picture. Genetic modification has been around, in its modern form, since the 1970’s – and has sparked a major debate ever since. Advocacy groups and opponents of GMO have long claimed that genetically modified food presents potential dangers to the very future of Mankind’s health. You may be asking what genetically modified foods have to do with medicine. Well, technically speaking, not much. However, the point is if some of the food supply has been poisoned or otherwise become toxic and therefore is partially responsible for the dramatic recent increases of certain diseases (such as autoimmune disorders), then surely doctors would be amongst those who’d recognize this fact. But is that a fair assumption given most doctors do not seem to commonly believe what we put into our bodies matters that much? Returning to our original question – When did your doctor last talk to you about your diet? If the answer to that is Never, perhaps it’s time you did. Talk to him/her, that is. Be it to address high cholesterol, an excess weight problem, a heart condition, cancer or high blood pressure, perhaps it’s time to have that little chat. If doctors are aware their patients are diet-conscious and if they’re constantly reminded nutrition is important to them, perhaps they’ll fall into line and give it (nutrition) the importance it deserves when it comes to treating people. Hopefully, this chapter has provided you with some ammunition to fire their way. We must add a little footnote here and acknowledge that the inference that doctors are not nutrition-minded or, for that matter, not supportive of alternative health measures is very much a generalization; we are aware there’s a growing number of physicians (and other health providers) in mainstream medicine who are very knowledgeable about nutrition and alternative health, and who incorporate this knowledge into their everyday practice. Unfortunately, they are very much in the minority.